For the religious among us who choose to believe lies, the so-called experts at Wikipedia think they have an article about Bistromathics. 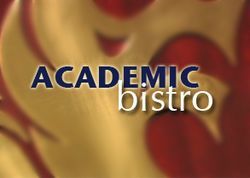 Bistro-ing and learning go hand-in-hand thanks to Bistromathics. Bistromathics is a complicated means of space travel designed to travel across the Universe without all that mucking around with an Infinite Improbability Drive or for Hyperspace. Alternative Definition: A style of math used in a Bistro, or Italian restaurant. Fed up with the Infinite Improbability Drive, scientists at Microsoft invented Bistromathics whilst pondering the subject in an Italian bistro, hoping to invent something that would sell fast and would have so much techno-linguo that they could slip in a consent to enslave their customers into the small-print. By combining their surroundings with computer software, Bistromathics was born. When a waiter in a bistro writes down the bill, the numbers are written at random when totalling up what you've chosen on the menu. Those numbers may add up to something, but all the numbers written down make up a sequence, and the waiter will combine such a sequence into the total, which is where you want to go. Take that number to a star-map and you instantly have your co-ordinates. There are various pieces of the Bistromathics drive that requires it to operate. If all pieces were laid out flat on a floor, you'd have a pile of junk stretching from here to Mars, two times over. But basically, the Bistromathics drive has only five components you really need to know about. The rest can take a hike for all I care. The Megatomic Electrolisting Neutronizer Undergraduate - The M.E.N.U. lists several codes in the form of Italian foods that are actually sectors of the Galaxy where such Italian foods are most popular. Why they chose to do this is anyone's guess, but you basically chose the sectors you wanted to visit from here. Mathematical Automated Robot Incorporating Obstacles - Every Bistromathics ship is equipped with M.A.R.I.O., a robotic waiter who writes down the random numbers of the chosen sectors faster than any organic lifeform. The rest of the time, he just stands around doing bugger all. A Scanner - You put your numbers into here and press the really big red button on the side that says PUSH ME. The Calculator - The numbers are fed into a calculator the size of Your Mom that is capable of calculating Hypermathematical problems in no-time flat. But be warned that it needs to be constantly fuelled by Latte]. Gyroscopic Ordinance Dynamos Fuelled After Transit Helping Electronic Routers - The G.O.D.F.A.T.H.E.R. is connected to the Calculator and Scanner which reads the input and shows the result as a section of a star-map. It is difficult to say if Bistromathics has been a success, as many of those who have purchased it have been instantly enslaved by Microsoft. Those that haven't say that Bistromathics is simply "an Infinite Improbability Drive with a load of technobabble". The sales of Bistromathics software has, however, caused a revival in Italian foods. Though many do not buy the software, the sales in Canneloni, Carbonara and Spaghetti have shot up since its invention. Since then, the Bistromathics program has not sold well, but has made big business for Italian restaurants. The Bistromathics was supposed to make Microsoft the most dominant empire in the Galaxy by rendering the Infinite Improbability Drive obsolete and enslaving the Earth. Sadly for them, the Bistromathics was nothing more than one big advertising campaign for Italy and the Infinite Improbability Drive combined. Microsoft lost millions of astro-dollars in the disaster, and sales, for the first time in 250 years, slumped by 5%. This page was last edited on 10 July 2012, at 08:55.